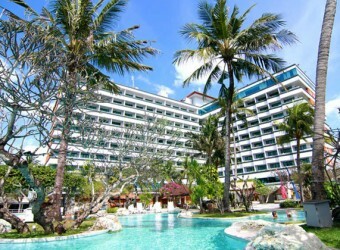 Bali Hotel It boasts of a vast eminent site of 45 hectares and the beach of white sand of 500 meters. There are 9 halls golf courses, bowling alley, and the soccer stadium, etc., so it is recommended for who want to spend holiday actively in Bali! The guest room has 3 types; 2-stories garden wing, cottage, and tower wing with all ocean view rooms. It has a nostalgic atmosphere, a little like an old Japanese luxury hotel. When I took spa treatment, I was surprised to see spa lobby is as luxury as hotel lobby.